Whether you’re just getting into this fitness thing or you’ve been at it for years, I have a couple of tips to make this habit just a bit easier and more fun. Who are we kidding? I have a ton of tips, but I’ll just focus on two today. The first is to like your workout clothes, and by that I mean, buy cute workout clothes. Don’t wear your hubby’s old t-shirt, no matter how comfortable it is. Don’t wear the shorts you weed your flowerbed in either. Give yourself permission to go shopping and get some clothes you really dig; clothes that are actually designed for exercise. It makes a world of a difference! Before you even start your workout, you’ll feel better just because you like what you’re wearing. Workout clothes breathe better, which helps you perform your workout better. An old t-shirt gets heavy and cumbersome as you sweat, and that is NOT a good feeling when you’re in the middle of a tough class. Today’s workout wear is so fun, fashionable, and comfy that I still feel and look somewhat decent running errands after my gym session. 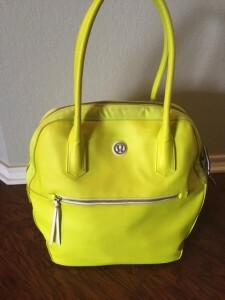 A photo of Susan Bell’s gym bag. My other tip is to invest in a good gym bag. Have that sucker packed and ready everyday. When I get home from the gym, I unload my bag, and restock it for the next day. It certainly does speed up the process of getting out the door each morning when my bag is ready to go. So, what should you have in your gym bag? I have perfected the art of packing a gym bag since I live out of mine. My gym bag may actually be a tad over packed since I teach fitness classes and want to be prepared for anything, but I’ve discovered a few essentials that everyone needs in their bag. I always have snacks in my bag. It’s a good idea to have a snack 30 minutes to an hour after your workout. I’m usually running errands at that time, so having snacks in my bag keeps me from making a less than healthy choice when I’m out and about. Sometimes, I burn through my breakfast before I’m done at the gym, so having a Kind bar on hand saves me in the middle of my workout. It’s also nice having extra snacks with me to help someone else who may not have fueled properly before class. A water bottle is an important part of a gym bag. 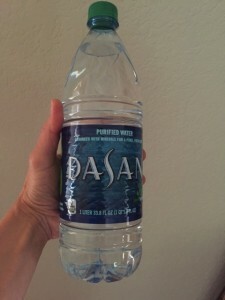 I bring a big, ole bottle to guzzle, not the little fun-sized, kid-sized bottles. I drink steadily throughout my workout and try not to let myself get thirsty. I’m a sweater, so I really love my little sweat towel. You may not think you need one if you are just starting out, but as your fitness level improves, the harder you can go, and the harder you go, the more you sweat. I have to “fake” my showers after class when my schedule is tight. Baby wipes do the trick until I can get home. 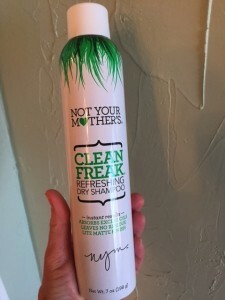 Dry shampoo is a great way to refresh after working out. Most gyms have the AC cranked; at least they do in the group fitness rooms. I almost always have a jacket on before I start class. After class, I’m sweaty and get cold if I don’t have a jacket. When you’re working out at an intense level, you’ll be breathing out of your mouth and your lips can get very dry. I always put on chapstick right after my workout. With all that mouth breathing, everyone’s breath needs a little freshening! Those are my essentials. With cute workout clothes and a well-packed gym bag, you’ll be ready to conquer the world or at least the gym. 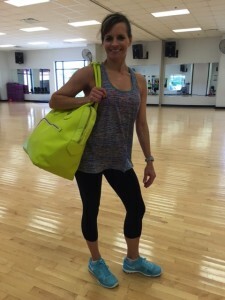 Susan Bell sports her gym bag.